Breakfast is definitely my favorite meal. There is something very gratifying about being able to wake up early while everyone is still asleep and make something special happen. There is nothing like being able to brew some coffee and have that first cup before anyone else, all while cooking. I have been experimenting with this baked egg dish that has lots of flavor and allows for perfectly runny eggs. That experience of breaking into the yolk of a well cooked egg is the best thing about breakfast. The dish I made is a baked egg on top of spinach, bacon and a bit of gruyere cheese. To prepare the spinach I sauteed onion and garlic in olive oil. 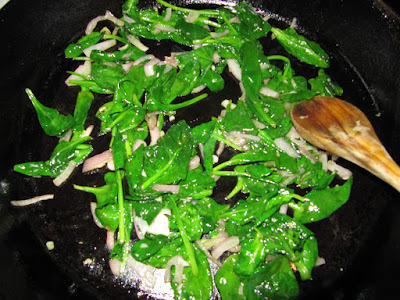 To this I added a couple handfuls of baby spinach and let it wilt down in the pan, absorbing the flavors of the onion and garlic. 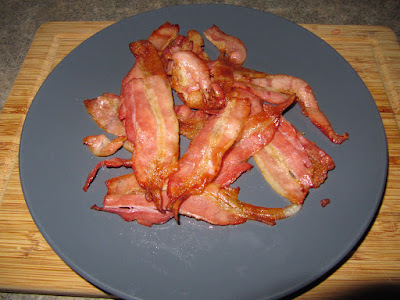 I cooked the bacon in the oven, using cooling racks in a cooking sheet so that the fat drips off the bacon. I found that this makes for crispier bacon. 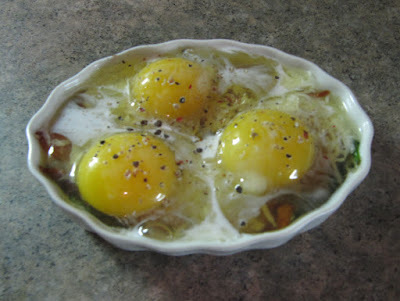 To bake the eggs I used small gratin dishes. The cooked spinach formed the bottom layer, on top of which I added bacon and gruyere cheese. Finally I topped all the ingredients with eggs, a splash of heavy cream, and some cracked pepper. 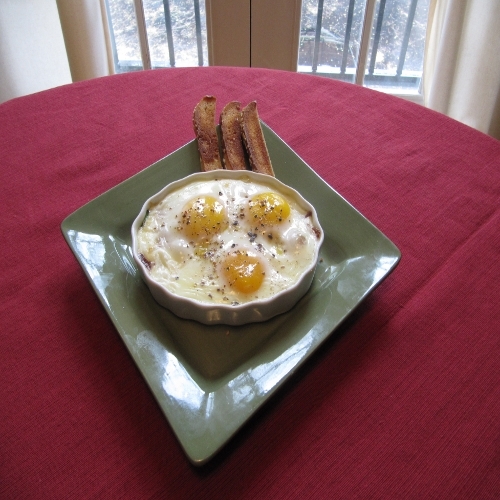 After about 20 minutes in a 350 degree oven, the egg whites set and the yolks came out runny and somewhat custardy in texture. to go with the eggs, I made sticks out of a couple sesame bagels which I then toasted with a bit of butter. 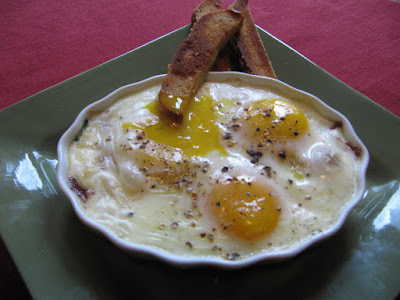 These make a perfect tool for digging out all the eggy goodness.